Sliders are a craze that seems to be holding its own. 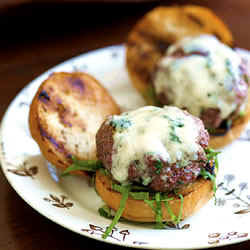 These itty bitty burgers make a great party appetizer, are easy to eat and are just the right bite without going overboard with the calories and fat. Sliders can also be made with cold cuts, pulled pork or chicken, veggies or fish fillets or cakes. Be creative when looking for slider buns. Small dinner rolls, brioche or pretzel rolls and even mini croissants will lend variety to the mix. Squares or rounds cut from sturdy sandwich bread would also be tasty and convenient. In a mixing bowl, combine the chuck, garlic, onion, salt, and pepper to taste. Mix gently but thoroughly to combine. Using a 2-ounce ice cream scoop, divide the mixture into 12 scant 2-ounce balls of meat. Using your hands, shape to form small patties about 3 inches wide and 3/8-inch thick (or to approximate the shape of your rolls). Preheat a grill to high and lightly butter the cut sides of the buns with the melted butter. Wrap the buns in aluminum foil and place on the coolest part of the grill to warm while you grill the burgers. In a small bowl whisk together the mayonnaise, sour cream and horseradish and season salt and pepper if needed. Place in a non-reactive bowl and refrigerate until ready to serve or for up to 3 days. Heat olive oil and butter in a medium skillet over medium-high heat. Add onions and cook for 6 minutes. Add apples and cook an additional 8 minutes or until onions and apples are golden brown and soft. Set aside and keep warm. Meanwhile, combine ground beef, egg, bread crumbs, parsley, garlic powder, Worcestershire sauce, salt and pepper and mix until well combined. Form mixture into 10 small patties. Saute patties in oil over medium high heat, 2 to 3 minutes per side or until meat thermometer registers 160º to 165º and meat is no longer pink in center. Top patties with cheese and allow to melt in pan. 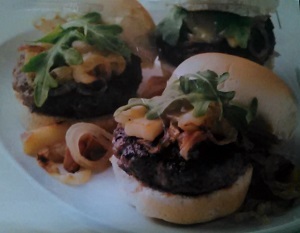 Place sliders on buns and top with apple-onion mixture and lettuce if using. Serve hot. In a large bowl, combine egg, oats, pepper and 2 tablespoons buffalo wing sauce. Blend well. Add chicken and blend. Shape the mixture into 6 1-inch patties. Heat a grill. Cook patties to an internal temperature of 165ºF being careful not to overcook. Prepare chicken sliders as preferred. In a medium bowl combine turkey, olives, oregano, garlic, cinnamon, nutmeg, salt and pepper. Evenly shape mixture into 6-8 mini-patties. Saute patties in oil over medium high heat, 2 to 3 minutes per side or until meat thermometer registers 160ºF to 165ºF and meat is no longer pink in center. Place cucumber slice on each roll bottom. Place turkey sliders on top. Top with a dollop of sour cream crumbled Feta cheese. 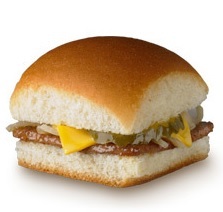 The term may refer to how easily the meat patty slides off the grill or how easily it slides down your gullet.